Neil Armstrong now belongs to the ages. The cremated remains of America’s greatest hero were buried in the Atlantic Ocean during a service aboard the USS Philippine Sea on Sept. 14 after slipping “the surly bonds of Earth” Aug. 25. The burial at sea came after funeral services in his native Ohio and a national memorial service Sept. 13 at the National Cathedral in Washington, D.C., where both present and past NASA administrators, astronauts, space scientists and congressmen were among the 1,500 who came to honor the 82-year-old former astronaut. Armstrong died from complications that resulted from his Aug. 7 cardiovascular surgery. 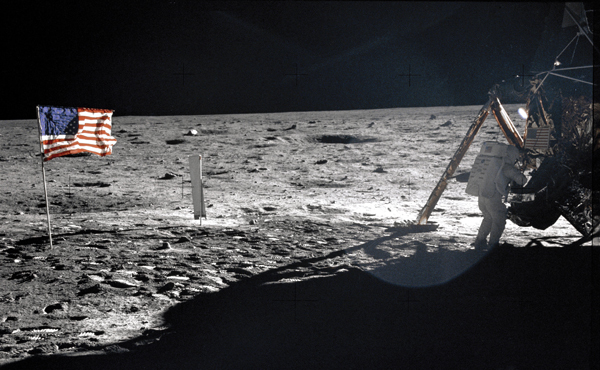 It was his and astronaut Buzz Aldrin’s footsteps on the lunar surface July 20, 1969 that brought victory to their country over Russia in the Cold War space race. But, as Armstrong took one a final step into the hereafter, it was another astronaut who reminded the crowd – as War Secretary Edwin Stanton had done when President Lincoln died – that he belong to the ages. Eric ‘Rick’ Armstrong pauses as he speaks at his father’s funeral in Ohio. Yet, he never wanted to be treated as a hero and shunned the limelight. As Cernan pointed out, the reluctant Armstrong said, “It’s not about me. 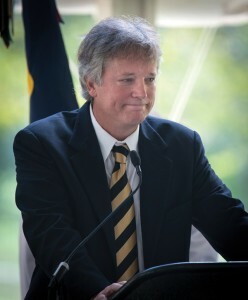 It’s about the 500,000 who made it possible.” It was that courage and humility that led Chris Kraft, then director of flight operations and later Johnson Space Center director, to suggest that Armstrong take that first step on the moon. No doubt as he looked down on the proceedings, Armstrong was embarrassed that the world was making such as fuss over him. After Apollo 11, Armstrong left the Clear Lake area, returning with his then-wife Jan to Ohio to teach and farm and raise their two sons, Mark and Eric. They returned in 1989, along the Lois and Buzz Aldrin and Mike and Kathleen Collins to join in the 20th anniversary celebration of the lunar landing that included a giant picnic at JSC and a big party and fireworks that evening at the Hilton, across from JSC. 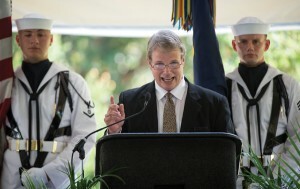 Mark Armstrong addresses the crowd attending his father’s funeral in Ohio. 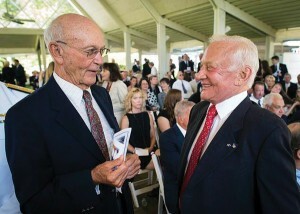 Both Aldrin and Armstrong also returned for the 40th anniversary ceremonies at Space Center Houston in 2009 – the last time many would see this humble hero who with Aldrin took a very special step into history. 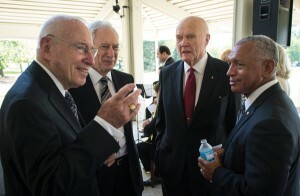 Famous faces in the crowd at the Ohio services for Apollo 11 astronaut Neil Armstrong included, from left, Apollo 13 Commander Jim Lovell, former NASA Administrator Dan Goldin, Mercury astronaut and retired Sen. John Glenn and NASA Administrator Charles Bolden. Apollo 11 astronauts Mike Collins, left, and Buzz Aldrin talk of old times as they await the start of services for Neil Armstrong in Ohio. 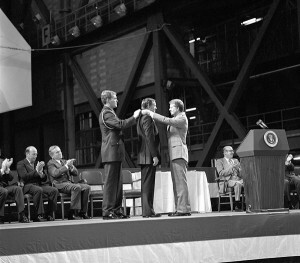 Retired JSC Director Chris Kraft Jr.: “We lost a tremendous human being. We lost a man who knew what he wanted to do, who was good at accomplishing whatever he set out to do. I considered him to be our lead gladiator. 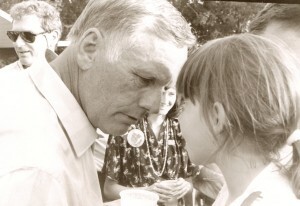 He spoke with integrity and a total commitment to his beliefs. 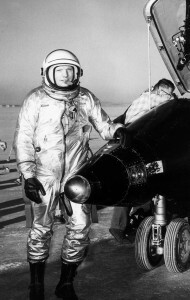 Armstrong is one of three former astronauts who have died this summer. Sally Ride, the first woman to fly in space, died July 23 at her California home after a 17-month battle with pancreatic cancer, and former Space Shuttle Commander Alan “Dex” Poindexter was killed in a Florida boating accident July 1.